The combination of pumpkin seed oil and saw palmetto has been described as "clinically safe and may be effective as complementary and alternative medicine treatments for benign prostatic hyperplasia (BPH)" (2). Our Prostate Support is a powerful blend of herbs and nutrients, including saw palmetto, stinging nettle, pumpkin seed oil, lycopene, and zinc all ingredients that have been shown to improve overall prostate and urinary tract health. Prostate cells have the highest concentration of zinc in the body, meaning it''s important for healthy prostate function. Pumpkin seeds are rich in zinc and nettle may help support a normal prostate size. 1. Christudoss P, Selvakumar R, Fleming JJ, Gopalakrishnan G. Zinc status of patients with benign prostatic hyperplasia and prostate carcinoma. Indian J Urol. 2011;27(1):14-8. 2. Hong H, Kim CS, Maeng S. Effects of pumpkin seed oil and saw palmetto oil in Korean men with symptomatic benign prostatic hyperplasia. Nutr Res Pract. 2009;3(4):323-7. 3. Xanthopoulou arianna, Fragopoulo E, Nomikos T, Antonopoulou S. Antioxidant and lipoxygenase inhibitory activities of pumpkin seed extracts. NeuroImage. https://www.sciencedirect.com/science/article/pii/S0963996909000453. Published February 10, 2009. Lycopene (LYC-O-MATO®, Natural Tomato Extract), Pumpkin Seed Oil, Saw Palmetto Extract (Berry) (Serenoa repens), Stinging Nettle Root Extract (Urtica dioica), Vitamin B-6 (from Pyridoxine HCI), Zinc (from Zinc Gluconate) , Softgel capsule (gelatin, glycerin, carob, water) and beeswax. Below we've broken down the main functions of our Prostate Support and the benefits it can provide. 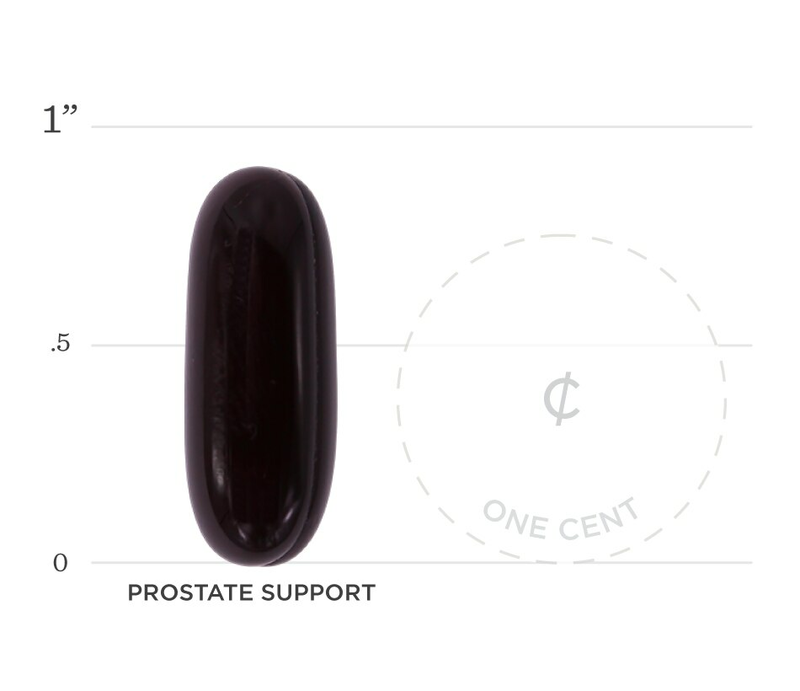 Research has shown zinc to play an important role in healthy prostate function. 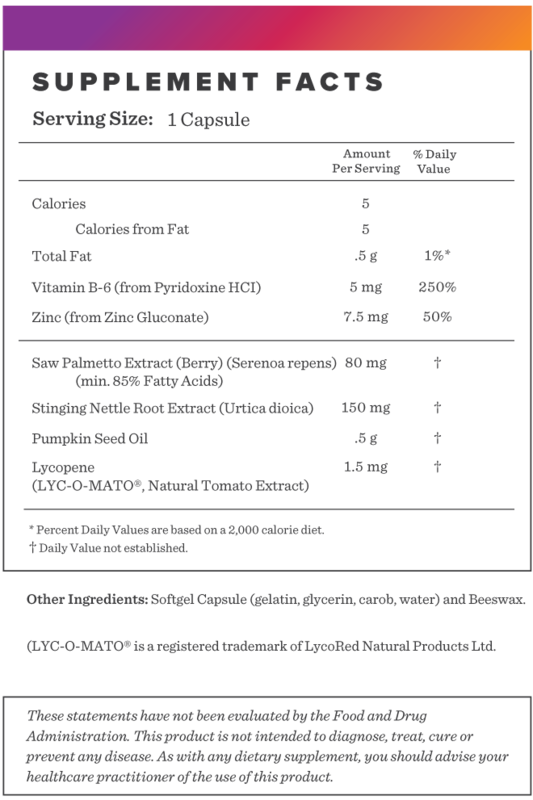 Pumpkin seed oil has been shown to reduce prostate size and improve urinary disorders. Pumpkin seeds are packed with antioxidants and carotenoids as well as zinc and omega 3''s which are known for their anti-inflammatory properties.